This sign south read SOUTH not BUSINESS. Historical photos show BUSINESS US 77 signage on the square. However, old maps do not show the business route. I haven't been able to find any evidence of it in the Highway Designation Files either. 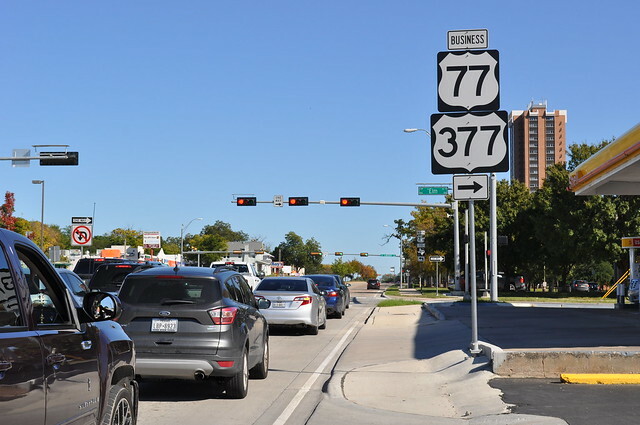 I've seen the no-u/no-left combo sign in Plano before, and maybe somewhere else. They are pretty rare, though. Historical photos show BUSINESS US 77 signage on the square. However, old maps do not show the business route. On the 1960 and 1973 editions of the USGS 7.5 Minute West Denton Sheet the old US 77 route near present Loop 288 North is labeled ALT 77 within the federal shield. On the adjoining Sanger Sheet it is labeled BR 77. On the Denton maps So Elm Street is labeled 377 within the shield.